This works best with thin asparagus, otherwise you might want to roast them a bit, first. Plan ahead here — the almond cheese requires preparation a day in advance. The next day, rinse the almonds well with cold water. Use your fingers to squeeze off the almond skins. Rinse again and soak for an additional 2 to 3 hours. Sample, and add more dill, salt and lemon to taste. After soaking, rinse the almonds well. Drain well. Place the almonds, garlic, oil, dill, lemon juice, salt and syrup in a food processor. Process until smooth, scraping down the sides when necessary. Refrigerate for at least a few hours, to let flavours meld together. To make the crust, place the flour, cornmeal and sea salt in a food processor. Pulse until combined. Add the coconut oil and apple cider vinegar. Pulse until there are pea-sized pieces of coconut oil among the flour. Turn the food processor on and add the water, a little at a time, just enough to make a cohesive dough. Gather the dough together, pat into a disc-shape, and cover in plastic wrap. Refrigerate for at least 5 hours. Remove the dough from the refrigerator about 20 minutes before you plan to roll it. Preheat the oven to 375F. Roll the dough into a large rectangle on a piece of parchment paper, about 8 inches by 10 inches. Use your fingers to crimp the edges into a crust. Transfer to a baking sheet and return to the refrigerator for 10 minutes. Spread the crust with the “cheese”. 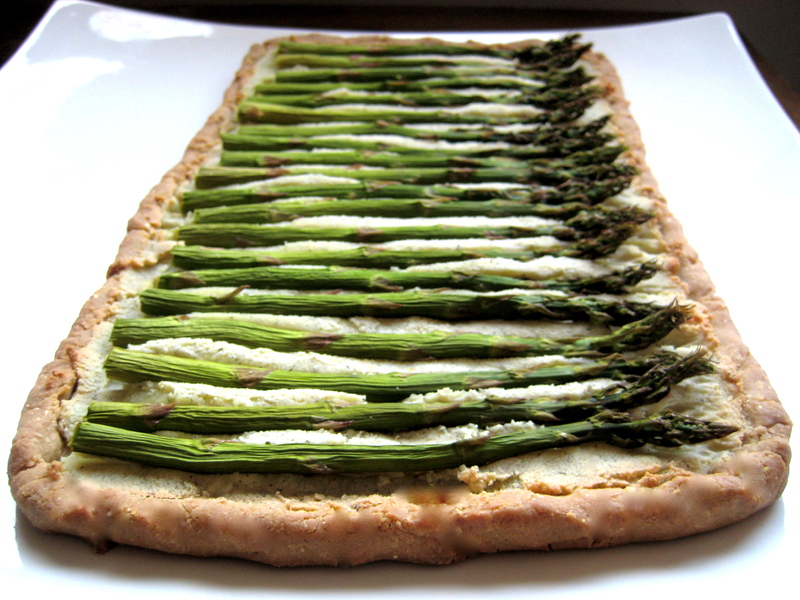 Top with the asparagus. Bake for 30 to 45 minutes, until browned. Serve at room temperature. Yet another totally delicious sounding recipe! My GOD this looks good. Thanks for the recipe! I am definitely going to try this.